Panelists talk about the findings of the State of Texas Children 2017 report during a discussion Tuesday in Edinburg sponsored by the Austin-based nonprofit group CPPP and Methodist Healthcare Ministries of South Texas. EDINBURG — The rate of children in the Rio Grande Valley who live in poverty is nearly double that of the state’s average, according to a report published by the Center for Public Policy Priorities. 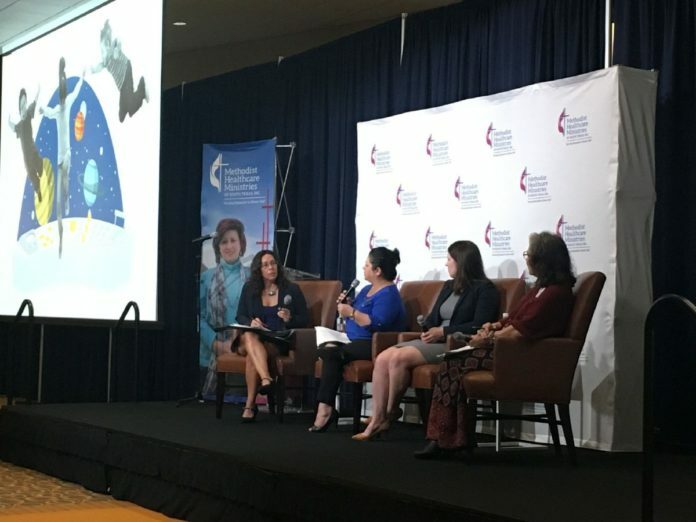 The report, titled State of Texas Children 2017, was the basis of the discussion held in Edinburg by Austin-based nonprofit group CPPP and Methodist Healthcare Ministries of South Texas. It found that about 43 percent of children in the Valley live in poverty compared to about 23 percent across the state. Thirty percent of children here, which amounts to 82,400 in Hidalgo County, lack consistent access to enough food for a healthy diet, compared to 27 percent statewide. In Hidalgo County, the uninsured rate was reported at more than 13 percent in 2015 while the statewide rate was at 10 percent. But access to care is an issue even before they’re born as 47 percent of women of childbearing age in Hidalgo County lack health insurance compared to 23 percent statewide. For the purposes of the study, childbearing age was considered to be between 15 and 44 years old. That could explain why more than 13 percent of pregnant women in the county received late or no prenatal care compared to the state’s average of fewer than 12 percent. Premature births here, at more than 15 percent, are also higher than the state’s 11.7 percent average. The maternal mortality rate here, however, is three times lower than the rest of the state — one death per 10,000 live births in the county compared to three deaths per 10,000 live births in Texas. One of the underlying issues could be the status of many parents living in the Valley and their fear of detainment if they apply for services. Many parents, she said, are worried that if they apply for services their citizen children qualify for, they will be targeted and deported. To address this, it’s important to inform parents of their rights, the rights of their citizen children, and what they are eligible for, according to Graciela Camarena, program director at the Children’s Defense Fund. That fear of being deported, Camarena said, also causes undercounting in the federal census. The solution, argued Kristie Tingle with CPPP, is to enact public policies that address these gaps like those that increase funding in public education, reauthorizing the Children’s Health Insurance Program and increasing parents’ access to health care.